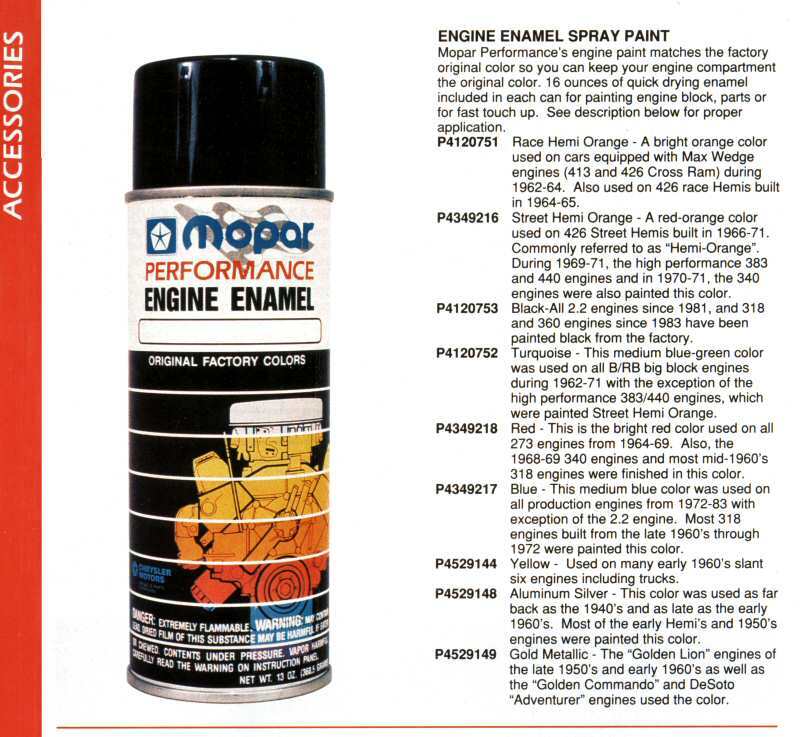 Below is what I have come up with as a good start to find the correct engine color for Mopar engines from 1960 to 1973. After about 1969 they were all pretty much Blue except for a few odd balls. I have seen Slant sixes in Black in the early 60's sales brochures but those are not the best source. I have used information from the Plymouth Owner's club, Walter P. Chrysler Club and various web sites to assemble this list. Engine colors were and still are subject of much debate. It seems no one at the factory really cared about any kind of specification for paint - as long as it got painted - it was ok. These are what I have found to be considered normal or standard - if there is such a thing. Your comments are welcome - however be prepared to back up your arguments with facts from somewhere. I would hope this will be a help to those who are trying to restore their classic Mopar to as near original as possible. The paint numbers are from Mopar Performance and may or may not be available from your local dealer. 1960 170 / 225 Six non Valiant Turquoise Mopar Paint P4120752 - Not sure about this color. ****Note: I have had much discussion about the years of 1970 and 1971 the RB and B engines - two club publications say blue (Judged sheets etc.) and it appears that official Chrysler (below) says turquoise was correct. On those two years let your original color be the one to use. Performance Parts Book - page 206. Here is yet another source of engine paint data. All "L" head in line engines 1924-1970, 4-6-8 cyl., silver with black accessories. Except - Prior to 1930 all 4 and 6 cyl. engines were finished in black. Except - Aluminum hi-compression heads were left in natural aluminum color. Except - SIlver green on Imperial 8's is also found on some 1924-1930 Chrysler 4's and 6's. Except - 1924-1942 "Red Head" engines factory hi-compression cast iron heads were painted red. Except - 1930-1934, large Imperial staight 8, silver green with black accessories. Except - All air flows 6's and 8's had engines fnished in black, if hi-compression aluminum head left natural, cast iron painted silver. Except - Engines with the word "Spitfire" cast in the head, the word Spitfire is sometimes painted red. Except - Korean War cars 1951-1953 some engines were painted flat light gray non-aluminum paint due to sortage of silver pigment. All early V8 double-single rocker shaft engines, 1951-1960, silver with black accessories. Except - All early hi-performance engines 1955-1960, silver with black accessories, gold valve covers, gold air cleaners, Plymouth Fury, Chrysler 300, Dsoto Adventurer, Dodge d-500. Except - 1955-1956 Plymouth 241-260-270 cu. in. V8, silver with black accessories, red valve covers, yellow air cleaner (hi-fire engine). 1960-1969 all slant "6", all "A" block V8, 273-318-340 V8 (LA) red with black accessories. Except - 1961-1963, "Hi-Perf. Pac" slant 6 with aluminum block and 4 bbl carb, silver with black accessories. Except - 1964-1966, hi-performance 273 V8, red with black accessories, black crinkle finish valve covers, chrome air cleaner. 1959-1961, 361-413 Golden Lyon, black with gold accessories, 361-383 V8 Golden Commando, red with gold accessories. Except - 1964-1964, all race hemi engines and orange with black crinkle finish valve covers, some had chrome air filters and accessories. Except - 1962-1964,short ram 413-426 engines, orange some had chrome air filters and accessories. 1962-1971, all "B" block engines corporate turquoise with black accessories - some with single 4bbl 426 V8's, chrome valve covers and air cleaners. 1970-1981, all 6 cyl. V8 corporate blue with black accessories, including 1972 and up Hi-Performance engines. Except - All Hi-Perfomance engines 383-440, 196901971 and All 1966-1971 street Hemi engines and 1970-1971 340's - street hemi orange (red-orange) with black accessories. 1978-1980, all 4 cyl. front wheel drive, silver with black accessories. 1981-on all 2.2 4cyl. and 318-360 V8 and 6 cyl engines, coporate black. This information was supplied in a slightly different form in the November 1994 WPC News on page 24. Compiled by Stanley Sepiol.